I just love bird chirping weather don’t you? Summer is just around the corner and I cannot wait to spend more time outdoors. Jordan and I have a lot of outdoor/hiking/camping vacations coming up. I love being outdoors, even though I cant dress to the nines I still like to look cute and fashionable when I am camping… is that dumb? During the Summer I live in head wraps, because they are so fashionable and practical. 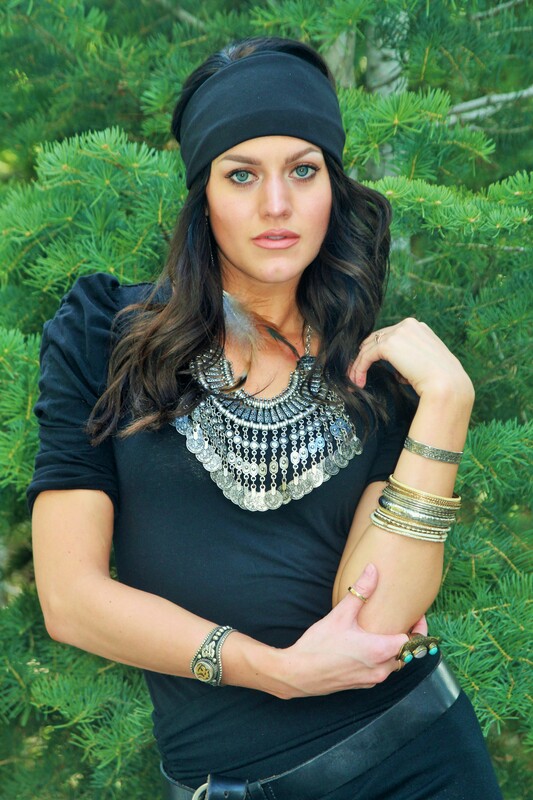 Moxie and Threads have so many cute head wraps for you and your minis be sure to check them out! Thanks for stopping by ! Thank you they go great together! I LOVE you every single thing about this outfit…I want to be all boho chic so bad…you totally nailed this look…especially the jewelry!!! Thanks Amber you are too cute! I”m obsessed with this necklace! What a beautiful piece! I know right me too, I think I wear it too much! Gorgeous outfit! I wish I could wear summer clothes, yet. Love that statement necklace!! U look so stylish!! I am in love with that ring! I love big, flashy rings with an antique look to them! Thanks Sabrina it def caught my eye! The ferns make your eyes pop! Love this post! I have nominated you for a Liebster Award! If you are interested, head over to my blog for the details! Ah thanks Cassie so sweet! How gorgeous is that neclace? What a statement! Beautiful photos. You look gorg! I love being outside and surrounded by nature. I’m hoping to take some hikes too this summer. Oh fun! You will have to tell me if there are any worth traveling to, my husband and I are big on that! Good to know. I will keep that in mind. Gorgeous eyes, love your necklace! I am LOVING this!! You look like a beautiful urban gypsy!! Spot on girl. This is the most original outfit I have seen in a long time! Oh thank you so much, that means a lot. Your so sweet , thanks babe! Chic boho look! The necklace and arm candy is amazing. Awesome style of shots. the jewelry was excellent. This is such a cool look I love that necklace! Everything about this look is so perfect and in LOVE with your necklace!! oh so sweet thanks, I know this necklace is my weakness! 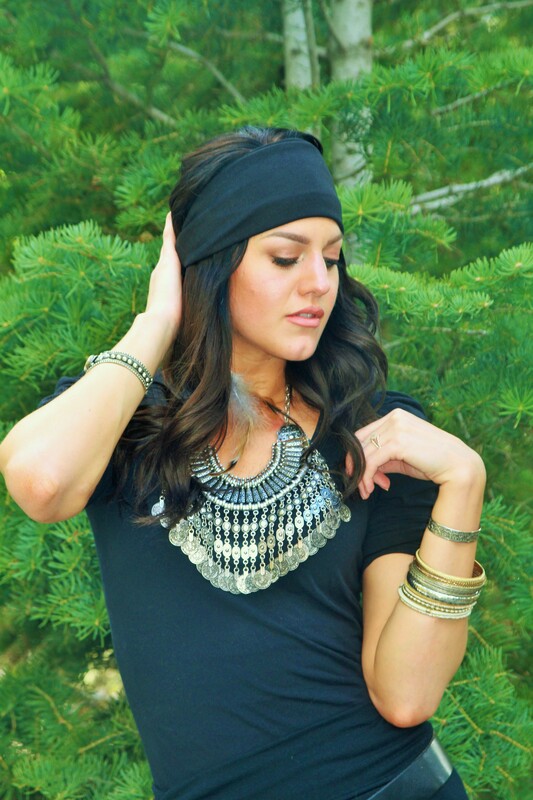 I love the headdress and the necklace is so cool! Loving the statement necklace it really pulls the whole look together! Oh and your eyes are gorgeous! I know right, I dont know how i lived without this necklace, and thanks stephanie that is my favorite compliment! This look is so cool! I love the dress and headband together! Those sunglasses and that necklace are such fun accessories! Thanks Megan it is def one of my favorites! Such a cool outfit, love the shot where you can see your eyes, they are such a beautiful colour I’m jealous!! oh my stop you have nothing to be jealous of you always got it goin on! haha Thanks camilla! Luv that look, girl. I’m a hat person, but I could swing that head wrap. You are rockin’ in. I love a good all black look, you did such an awesome job at styling this look! Your accessories are on point! And you’re rocking that head wrap!! So sweet thanks Dee, I am with ya all black is such a timeless look. Thanks for stopping by! Oh thank you Mira! I live for head wraps in the summer! THank you Naeun, such a sweet compliment!